I’m sorry for my absence on the blog. 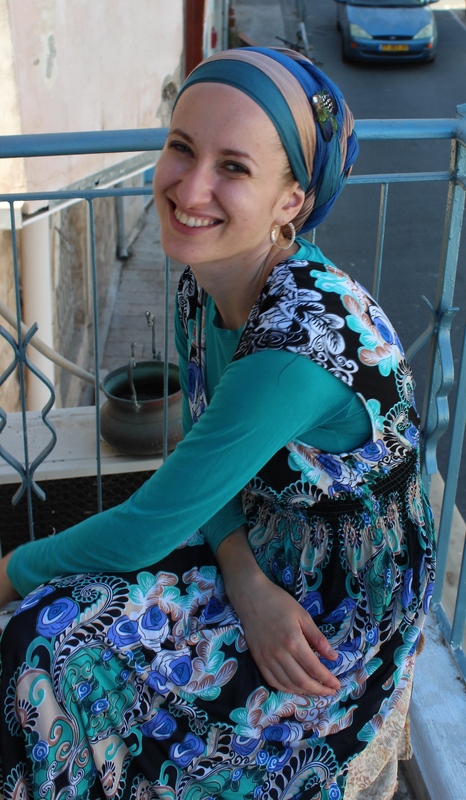 For those of you that have been reading the news and following me online, you’ll know that the last couple of weeks in Israel have been difficult, and even though I’ve continued to rock beautiful head wraps every day, for some reason posting them just didn’t feel right. I do have lots of photos, though, and Gd willing they will be posted when I get back! So here is a lovely double braid, for your viewing pleasure. Do you ladies think I’ll ever get tired of discovering new combinations to do this with? With a solid collection of 2 in 1s, you can match pretty much any article of clothing perfectly! This dress is another gorgeous Jerusalem find! I love its modesty and subdued colours! ← Tutorial: Olive Grove aka Layered Waterfall Twist! It is beautiful,color, dress everything. Travel save and enjoy the last day/afternoon. May HaShem be with you. So glad to know that you are alive and well. Baruch HaShem! We are praying for the safety of the Israeli nation. Safe travels home! I hope your friends and family in Israel are o.k. It is always such a joy to see your lovely face and the beautiful crowns you create. You always make my day! Thank you for taking the time to share this in spite of all the troubles that are happening around you. There is always room for beauty. Hello from sunny England, it’s great you’re back Andrea! Fab outfit and look forward to catching up on your wraps from the past few weeks. eu simpilmento amei tudo!!!! ficou lindo!!! So glad you are coming home safe, and I pray for the safety of all the people of Israel. “Every single instrument in that orchestra is essential.” “Curiosity is the antidote for defensiveness.” Thank you, for these words. Oh, may we find harmony, somehow. B”H for your safety so far, and may he bring you back safely to the U.S. and us. I love the dress and the color combos you choose. Beautiful as always. I’ve missed your posts! What is needed in Israel right now, is beauty, bright colors, and a joyful life – especially in the face of people who would take that away from us. Remember, the best revenge is living well. Am Israel Chai! So glad to finally hear from you Andrea! You have been on my mind a great deal. Travel safely! 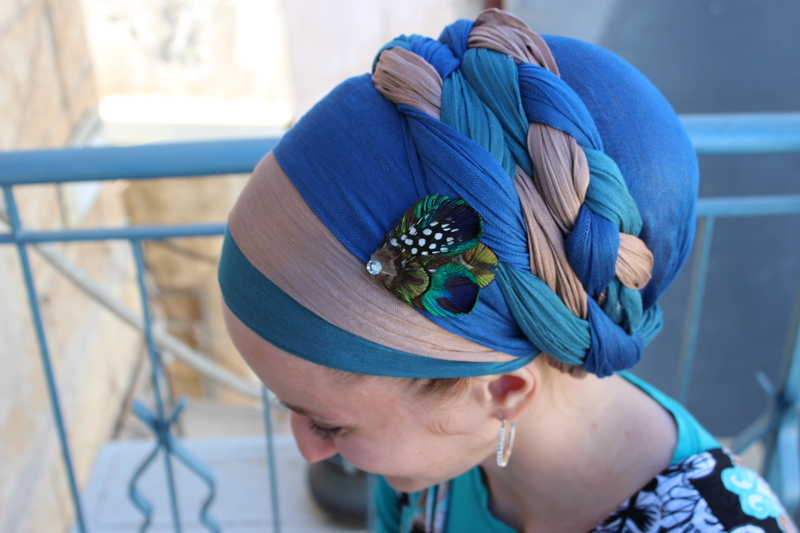 Unfortunately, I have a huge assortment of 2 in 1’s, but they don’t work for me for the DB as I wear my tichel quite high on my head and even braiding it loosely, I run out of scarf ends! The good news is, I will soon be sewing up some vintage saris and with the leftover scraps, I intend to make some very long scarves…hopefully that will solve the problem. Please let us know when you are home safe and sound back in Baltimore! Thinking of you, and all in Israel. Blessings and a safe journey home. So beautiful! I am so glad that you are safe and still going strong. Can’t wait to see your new pics! I am praying for your safe travels. Much love to you, Andrea.